Magento Ajax Cart Pro Extension is a perfect solution to allow your customers shopping without waiting for the pages to be refreshed. Magento ecommerce platform is one of the best grade at its excellence. In some cases, default Magento is not optimized for online shops. 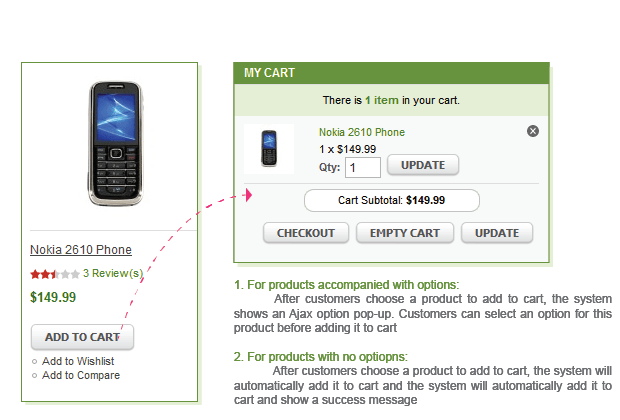 Add-to-cart process is a weakness, the page has to be reloaded when shoppers add, edit or remove products in their cart. This long process annoys shoppers, reducing their user friendly experience and affecting your sale volumes. Therefore, we need to improve the process with an enhanced extension. With our Magento Ajax Cart Pro Extension, users can add, update or remove products from an Ajax pop-up on your Magento eCommerce store in a much easier way, without reloading the cart continuously. Customers can add products to a Magento ajax shopping cart and choose options right on the listing page, without going back the product page. Able to choose options of a product before clicking "add to cart"
For products which have custom fields, customers won't have to access the product details page, shoppers can choose options (quantity, size, color…) before adding products to the cart on the listing page. 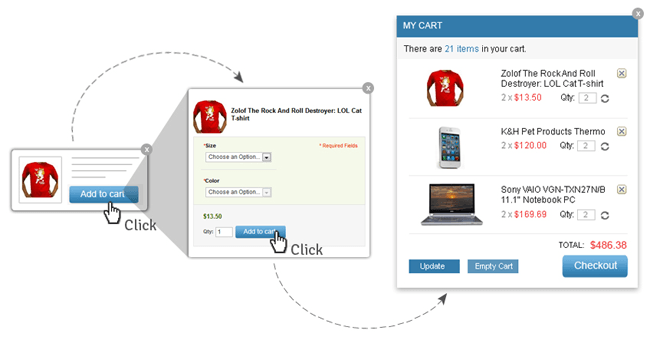 To make the shopping on your store more interesting, you can use animation effects for Magento Ajax cart. Let's imagine how excited customers feel when products fly to Mini cart or My cart link. 5 COLORS AVAILABLE( Blue, Black, Pink, Red, Gray), suitable with many different types of ecommerce business- Virtuemart admin can choose colors from the admin panel. 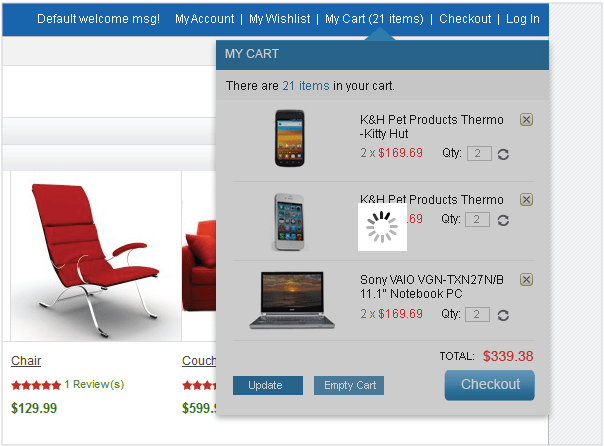 Display empty/update/checkout buttons on mini cart. Magento e-commerce platform is one of the best grades at its excellence. In some cases, default Magento is not optimized for online shops. The add-to-cart process is a weakness, the page has to be reloaded when shoppers add, edit or remove products in their cart. This long process annoys shoppers, reducing their user-friendly experience and affecting your sale volumes. Therefore, we need to improve the process with an enhanced extension. Magento Ajax Cart Pro Extension is the best solution to save time on shopping. Using Magento Ajax cart pro on your site will make your customers feel more interesting in their shopping. This plugin is very easy to use for your clients. With 2 steps below, you can work well with your website. Firstly, you go to product which you interested. If you love it, you only click Add to cart button. Then you go to your cart to manage your cart. At your cart, you can update quantity, empty cart or checkout easily. Step 1: Extension Installation. There are 2 installation options are available for you as Option 1: Install quick start packages and Option 2: Upload extension via FTP. Step 2: Extension Configuration. Firstly, refresh all cache in Cache Management; index all data again in Index Management. Secondly, in Magento Admin Panel go to System >> Configuration >> Cmsmart Extension >> Ajax Cart, then setup as you want. Don’t worry! Our products is easy set up for shop owner, you can configure easily in admin panel. Add products to the cart from a listing page: Customers can add products to a Magento Ajax shopping cart and choose options right on the listing page, without going back the product page. Able to choose options of a product before clicking "add to cart”: For products which have custom fields, customers won't have to access the product details page, shoppers can choose options (quantity, size, color…) before adding products to the cart on the listing page. Quickly update a mini cart: For those sites with mini carts, customers can easily update quantity, remove products from a cart. Animation effect for Magento Ajax cart: To make the shopping on your store more interesting, you can use animation effects for Magento Ajax cart. Let's imagine how excited customers feel when products fly to Mini cart or my cart link. 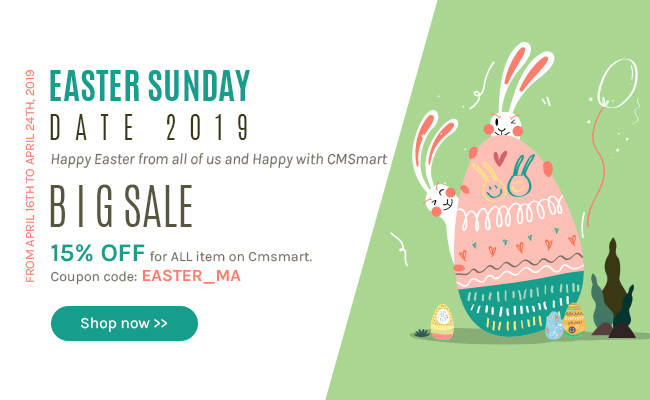 Support multiple themes: 5 COLORS AVAILABLE (Blue, Black, Pink, Red, Gray), suitable for many different types of e-commerce business- Magento admin can choose colors from the admin panel. 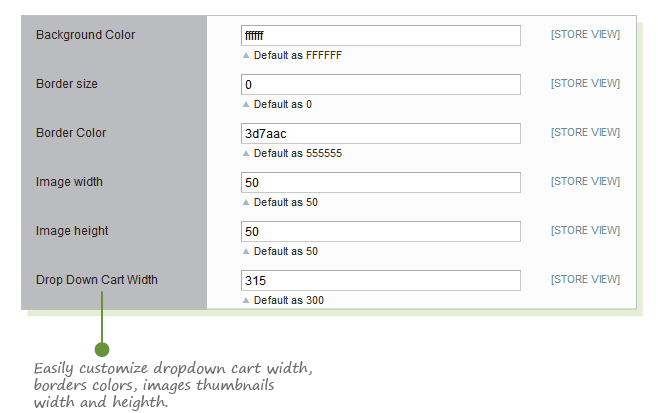 Easily customize theme colors: Easily customize dropdown cart width, borders colors, images thumbnails width and height. 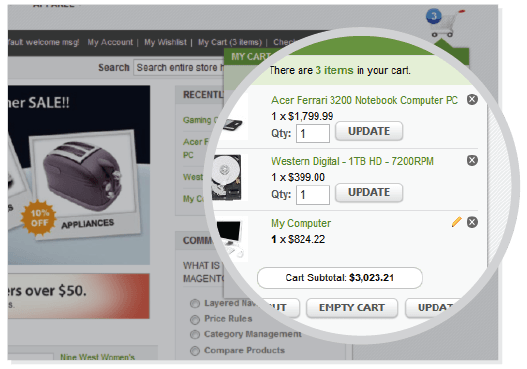 Display empty/update/checkout buttons on mini cart: Just choose to enable/ disable/ update/ checkout button on the mini cart from admin panel. Magento Ajax card extension is open source 100%. Stable function in the product detail page. Easy install with proper documentation. Modules created with proper Magento MVC structure. Able to enable/disable the features from admin panel at any instance. 5 stars for your product quality is fully deserve! I am totally satisfied when my customers have not to reload the cart continuously so the percentage of loyal customers on my site increases significantly recently! Thank you so much! All hesitation and doubt had been removed when I use your Ajax Cart Pro Extension. My customers are satisfied and come to my sites far more than before. Highly recommend! Without waiting for the page refreshing, speed has improved significantly, this is also the reason why the number of customer increases. you had done good job. Awesome! 5 stars for everything! Feature wonderful, there are lots of features in it, and it works great with my website. Many thanks. The Magento Ajax Cart Pro Extension seems pretty good. I've been using this ext for few months. The features of this ext are simply awesome. Really it is very helpful. Thanks to the developers. I tried lots of Ajax Cart plugin for Magento but this one is absolutely better. It worked on my custom theme without any modification. There was some small bugs and developer fixed them. We bought two extensi from cmsmart. there are some issues with our custom theme after the installation but Dang was so helpful and patient to help us to resolve the issue one by one. Great support and will buy extension from them again. Another excellent extension from CMSmart! Thanks guys! I bought this extension and a few other extensions together with the Magento Furniture template. Ajax Cart Pro makes the webshop look very professional and due to the animation it's really fun to place something in the cart. I had some problems after installing but support is great. They helped me fix all problems! This tool will make it much easier for our customers to shop. The support we received with this extension was amazing. Almost an instant reply & our request for customisation was accepted with no hassle. Great company & extension. 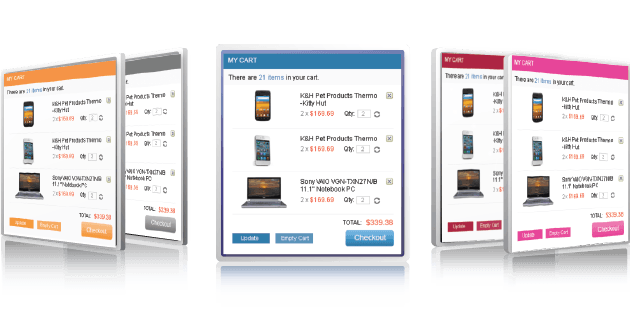 Good ajax cart extension at competitive price. I have to say that this extension meets my need for a revolution shopping cart facilitating my customers’ shopping processes. Thank you for your product. It is a very powerful and useful extension. Easy to use, no conflict in installation and great support. Thanks all! 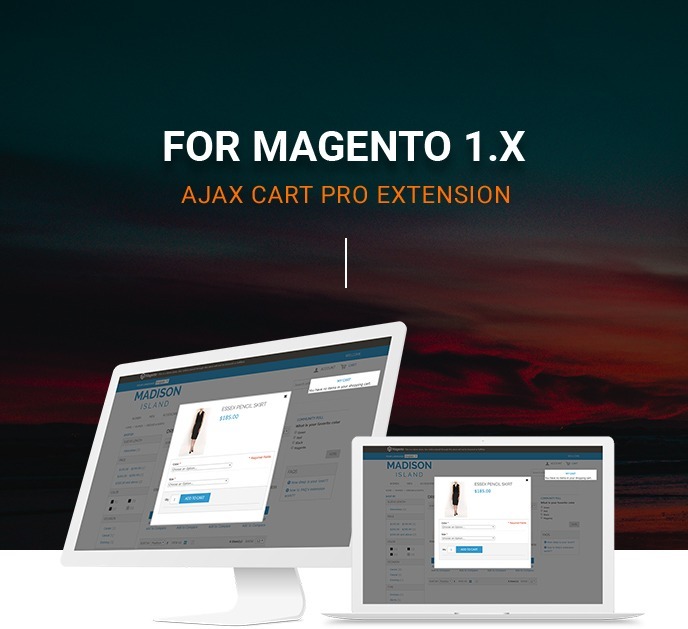 I perchased and used this products - The Magento Ajax Cart Pro Extension one month. And I'm happy because my customer is increasing, and they don't complain while adding, updating or removing products. Thank you so much! Magento Ajax Cart Pro is nescessary for my site. when i using this product, i recieved many good feedback of customer about convience when they want to add, edit of remove products. thank to deisgn so much! I'm very satisfied with CMSmart. Not only this products is very good but also the team support is enthusiastic, they helpful and patient with me. I will give you 5 stars. A good product technology, user friendly and very good service from CMSMart. Thank you. A desired extension, my customers to buy quickly and can be controlled better cart, very friendly and I feel satisfied. I love it. This product has solved all the problems that my website had met before, my customers complained that they always wait along time when products is added to cart, now, the problem no longer exists, everything is good. Thank the developers . I really do appreciate it. Will this AJAX Shopping Cart work on mobile devices? Yes, you can use it on any device from Pc, laptop to mobile, table. Does this module let customers add products to cart from category pages? Can I let clients adjust the quantity/color/size of a product in a pop-up window? Yes, customers can adjust the quantity in the dropdown with Magento 1 or pop-up window with Magento 2. Does this AJAX Shopping cart module work with up sell products? Yes, you can add the up-sells product to cart with Magento 2 version. Can I customize the AJAX cart window to match my theme? Is there an option to continue shopping after adding an item to cart? Does the AJAX Cart Pro extension allow displaying up-sells or cross-sells on the popup window after adding product to cart? Yes, the up-sells and cross-sells product will be displayed on the popup with Magento 2 version. About Magento 1, we will upgrade this function in the near future. Is this working for Configurable product? Yes, but with configurable product, you need to choose the product attribute such as color, size with a popup before adding to cart.